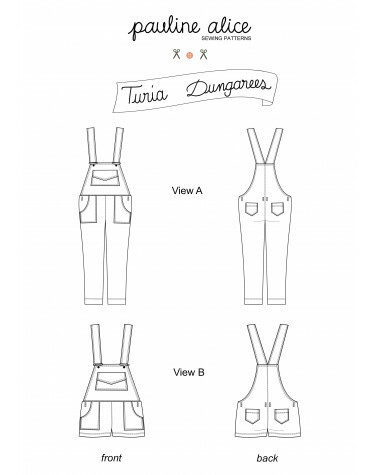 The Turia dungarees feature front and back patch pockets, zipped sides, classic pinafore back and adjustable shoulder straps. View A has cropped ankle length tapered legs. View B is the short version. -Thread, two 35/40 mm (1 1/2") wide dungarees buckles and no-sew buttons (hammer needed! ), two 20 cm (8”) regular zippers. Find a series of tutorials on the blog.